The one species of Callorhinus, the northern fur seal (Callorhinus ursinus), inhabits the North Pacific, while the seven species in the Arctocephalus genus are found primarily in the Southern hemisphere. The Antarctic fur seal (Arctocephalus gazella) breeds on islands between 45° S and 60° S and its winter range, while not known, likely includes the seal spending its time close to the Antarctic ice. Fur seals are marked by their dense underfur, which made them a long-time object of commercial hunting. The fur seal trade often included clubbing them to death on remote, uninhabited islands, where they had hauled out to breed and raise pups and were not used to predators. Many populations suffered precipitous declines. Most species are now protected and while some populations are still recovering, most populations are considered healthy. Fur seals have in various ways captured the human imagination and added to the wonder of nature, particularly as seen in the massive congregations of some populations on remote islands for raising pups and breeding. Ecologically, they play a role in marine food chains, consuming krill, fish, and squid, and being an important food resource for sharks and other larger marine animals. Fur seals are a type of "eared seal"; that is, marine mammals comprising the pinniped family Otariidae and characterized by presence of a pinna (external part of ear), the ability to invert their hind-flippers under the body, aiding land movement, proportionally long and relatively muscular fore-flippers, and a swimming motion using their long front flippers to propel them through the water. There are 16 extant species of otariids placed into 16 species and variously known as either fur seals or sea lions. Until recently, fur seals were all grouped under a single subfamily of Pinnipedia called Arctocephalinae, while sea lions were grouped within the subfamily Otariinae. This was based on the most prominent common feature of fur seals, namely the coat of dense underfur intermixed with guard hairs. Recent genetic evidence, however, suggests that Callorhinus is more closely related to some sea lion species (Wynen et al. 2001), and the fur seal/sealion subfamily distinction has been eliminated from most taxonomies (Brunner 2003; ITIS 2006). Nonetheless, all fur seals have certain features in common: the characteristic fur, generally smaller sizes than sea lions, more pointed snouts, longer fore-flippers, farther and longer foraging trips, smaller and more abundant prey items, and greater sexual dimorphism. For these reasons, the distinction remains useful, although it is not a formal taxonomic rank. Fur seals have a thick, luxuriant coat of fur (pelage) (Riedman 1990). The underfur, which is waterproof, is covered with long, "guard" hairs that give them a "somewhat grizzled appearance" (Riedman 1990). Their pelage also tends to be darker and the vibrissae (whiskers) more prominent than that of sea lions. Fur seals share with other otariids the ability to turn their rear limbs forward and move on all fours. Fur seals are generally smaller than sea lions. At under one meter in length, the Galapagos fur seal is the smallest of all pinnipeds. However, their flippers tend to be proportionately longer. Males are often more than five times heavier than the females, making them among the most sexually dimorphic of all mammal groups (Weckerly 1998). For example, a large bull Northern fur seal can weigh 600 pounds and a large female 110 pounds (AFSC). A seal at Living Coasts sunbathing on a rock. 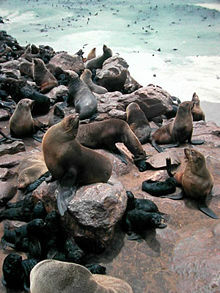 Typically, fur seals gather annually during the summer months in large assemblages at specific beaches or rocky outcrops to give birth and then breed. For example, while the northern fur seal (Callorhinus ursinus) normally ranges from Japan to southern California and north to the Bering Sea, during breeding season three-quarters of the total world population congregates on the Pribilof Islands (AFSC). About 95 percent of the population of the Antarctic fur seal (Arctocephalus gazella) breeds at South Georgia, making the concentrations at South Georgia one of the densest aggregations of marine mammals on earth. All species of fur seals are polygynous, meaning dominant males reproduce with more than one female. For most species, total gestation lasts about 11.5 months, including a several month period of delayed implantation of the embryo. Sometime after birth, perhaps a week or two later, the female goes into estrous and breeds. While northern fur seal males aggressively select and defend the specific females in their harems (AFSC), males of southern species of fur seal tend to protect spatial territories and females are free to choose or switch their mates according to their own preference or social hierarchy. After several continuous days of nursing the newborn pups, females go on extended foraging trips that can last as long as a week, returning to the rookery to feed their pups until they are weaned. Males fast during the reproductive season, unwilling to leave their females or territories. Bulls of the northern fur seal may lose one-quarter of their body weight protecting their territory (AFSC). The remainder of the year, fur seals lead a largely pelagic existence in the open sea pursuing their prey wherever it is abundant and plentiful. Fur seals feed on moderately sized fish, squid, and krill. They are preyed upon by sharks, orcas, and occasionally by larger sea lions, and the northern fur seal may be preyed upon by polar bears as well. When fur seals were hunted in the late eighteenth and early nineteenth centuries, they hauled out on remote islands where there were no predators. The seal hunters reported being able to club the unwary animals to death one after another, making the hunt profitable even though the price per seal skin was low (Muir 2000). Many fur seal species were heavily exploited by commercial sealers, especially during the nineteenth century when their fur was highly valued. Beginning in the 1790s, the ports of Stonington and New Haven, Connecticut were leaders of the American fur seal trade, which primarily entailed clubbing fur seals to death on uninhabited South Pacific islands, skinning them, and selling the hides in China (Muir 2000). Many populations, notably the Guadalupe fur seal, northern fur seal, and Cape fur seal, suffered dramatic declines and are still recovering. The Antarctic fur seal (Arctocephalus gazella) was very heavily hunted in the eighteenth and nineteenth centuries for its pelt by sealers from the United States and the United Kingdom. By the early twentieth century, the seal was regarded as commercially extinct, and perhaps completely extinct. In fact, a small population continued to exist, breeding on Bird Island in South Georgia. This colony has expanded rapidly over the course of a century. The current populations on the other islands are believed to be off-shoots. It is estimated that there now may be two to four million individuals breeding at South Georgia and 15,000 at Heard Island. Some people believe these populations have grown to such levels because the removal of whales by the intensive whaling of the twentieth century left a surplus of krill. Currently, most species of fur seals are protected and hunting is mostly limited to subsistence harvest. Globally, most populations can be considered healthy, mostly due to the fact that they often prefer remote habitats that are relatively inaccessible to humans. Nonetheless, environmental degradation, competition with fisheries, and climate change potentially pose threats to some populations. Alaska Fisheries Science Center (AFSC), National Marine Mammal Laboratory. n.d. Northern fur seals National Marine Mammal Laboratory. Retrieved July 4, 2008. Brunner, S. 2003. Fur seals and sea lions (Otariidae): Identification of species and taxonomic review Systematics and Biodiversity 1(3): 339-439. Integrated Taxonomic Information System (ITIS). 2006. Scientific Name: Otariidae Gray, 1825 Integrated Taxonomic Information System-North America TNS 180615. Retrieved July 3, 2008. Muir, D. 2000. Reflections in Bullough's Pond: Economy and Ecosystem in New England. Hanover: University Press of New England. ISBN 0874519098. Weckerly, F. W. 1998. Sexual-size dimorphism: Influence of mass and mating systems in the most dimorphic mammals Journal of Mammalogy 79(1): 33–42. Retrieved July 3, 2008. Wynen, L. P. et al. 2001. Phylogenetic relationships within the eared seals (Otariidae: Carnivora): Implications for the historical biogeography of the family Mol. Phylog. Evol. 21: 270–284. Retrieved July 3, 2008. This page was last modified on 23 July 2008, at 02:56.